Similar to other mobile tech giants, Microsoft also has decided to offer multi-function devices referred to as the 2-in-1s. This means Windows 8 devices are now able to function as laptops, tablets or even desktops with extra accessories or altering with screen orientation, otherwise known as screen mirroring or streaming. Such technology is patented and popularized by Miracast. Windows 8 tablets are among the devices that Miracast has allowed to wirelessly connect to monitors and televisions. But unlike the usual method of connecting with an HDMI or VGA cable, Miracast is requiring users to buy or secure a compatible Miracast adapter or smart television that is already integrated with Miracast technology. In order to handle both Miracast streaming and wireless network, a powerful processor on the device is necessary. In order to get streaming working, you will need to use a compatible Miracast device. Netgear NeoTV Max adapter appears to be the most recommended. 1. Turn on your television and Miracast streaming device and make it ready to receive a stream. If you are using a NeoTV Max, you will do this by turning the device on with its remote control and then opening the Intel WiDi app. 2. Get your Windows 8.1 equipped 2-in-1 laptop or notebook. 3. Go to the Start screen by pressing the Windows key on your keyboard. You can find the Windows button beneath or near the device's display/screen. If you are using touch devices, place your finger on the right edge of the display and then slowly slide your finger to the left and tap on Start. If you are using mouse and keyboard, just point the cursor to the upper-right corner of the screen and then open the Charms Bar. 4. Place your finger on the right corner of the screen and slide it slightly to the left. Click or tap on Devices to continue. 5. Click or tap on Project. 6. Click or tap on Add a Wireless Display option. 7. Tapping on the Add a Wireless Display will lead you to the Settings app. Let the device scan for any wireless Miracast receivers available on your home network. In case you haven't yet setup your streaming device, I suggest you do it now. Also don't forget to assign a name to your receiver device. 8. Click or tap on the name of the receiver you want to pair with your Windows 8 device for Miracast streaming. 9. Type in the code (WPS PIN for your television) and click or tap on the Next button to proceed. You should now have the two devices connected and ready for Miracast streaming. 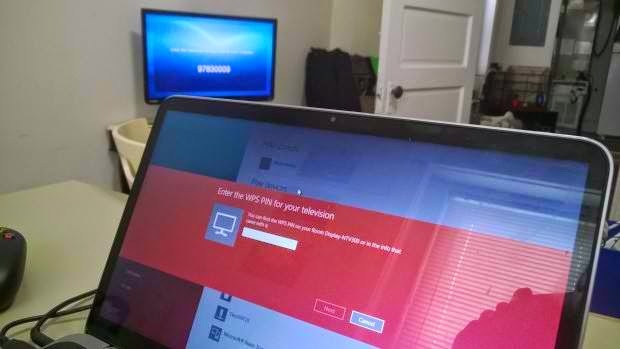 When Miracast streaming is activated, whatever is displayed on your Windows 8 device will duplicate or also show up on the TV screen attached.